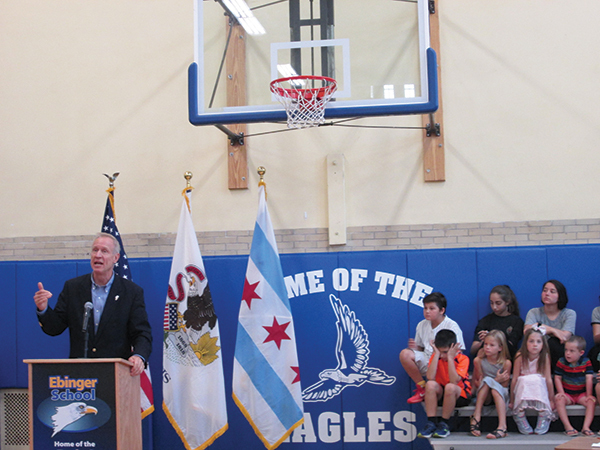 Governor Bruce Rauner signed a bill that would change how funding is distributed to school districts at a bill-signing ceremony held Thursday, Aug. 31, at Ebinger School, 7450 W. Pratt Ave. Flanked by Mayor Rahm Emanuel, Senate President John Cullerton, Senate Minority Leader Bill Brady, Senator John Mulroe (D-10) and other legislators, Rauner signed the "compromise bill." "Today, we ensure that in the future every child in Illinois has an equal chance at an excellent education," Rauner said. "Every student in Illinois has an equal opportunity to achieve the American dream. This is a wonderful achievement." The bill will change the funding formula for state schools and increase the amount all districts receive, creates a $75 million tax credit program for people who donate to private school scholarships, and allows the City of Chicago to increase property taxes to fund teachers’ pensions. CPS would receive up to $450 million in state funding. Rauner vetoed a similar bill in July after previously calling it a "bailout" for Chicago Public Schools’ pensions. The Senate then overrode his veto by a 38-19 vote on Aug. 13. Before the veto, CPS was to be provided with almost $250 million more than other districts to help with pension funds. Rauner’s veto removed about $500 million in funding from CPS. With not enough votes to override the veto in the House, the House voted Aug. 28 to approve Rauner’s bill 73-34, and the Senate approved its version on Aug. 29. "In the end, I think the possibility of schools statewide shutting down made Rauner and other Republicans realize they had to do something," state Representative John D’Amico (D-15) said in an interview. State Senator Andy Manar (D-48), sponsor of the bill, said that 27 factors such as the cost to establish adequate student-per-teacher ratios or hire adequate ancillary staff such as counselors would be utilized to create a target-funding threshold for each school district. "There’s research that shows what success takes. We broke them down into those factors and we apply money to that," Manar said at the event. "For instance, how many speech language pathologists do you need in a school with bilingual students versus those without? We measure all those things ([as a) matrix of what success is, and how you attach costs to that." Illinois Education Secretary Beth Purvis said that "we’ll distribute funds based on the gap between what schools need for that adequacy target and what they can raise," resulting in poor and needier districts generally receiving more in state aid. To avoid competition between poor and wealthy school districts over state aid, the law guarantees that no school district will lose money, at least until school year 2020-21 when funding mechanisms will be based on per-pupil rather than per-district. "Today we’re choosing students over a failed status-quo," Emanuel said. "Children have been measured based on parents’ paychecks, not their achievements, by zip code and not their character." State funding for CPS pensions was originally a sticking point for Rauner, who repeatedly referred to it as a "CPS Bailout" in recent months, and represents roughly $150 million more than provided in the original bill Rauner vetoed. The Chicago Public Schools Board of Education was granted the right to potentially levy an additional $120 to $148 million in city property taxes for teacher pension payments. The potential tax implications come on the heels of $543 million in Chicago property tax increase being phased in since late 2015. Republicans were able to preserve a portion of the bill whereby $75 million in private tuition scholarship tax credits is available. Donors would receive 75 cents off their state tax obligation for every dollar given to private scholarship funds used to give school-choice to families from poor backgrounds. This measure was supported by Rauner and other Republican allies, and derided by others as a cost-inefficient measure that would lead to further school privatization. 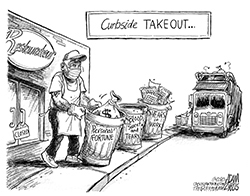 "There’s about 2.2 million public school students, and around 500 thousand private school students," Mulroe said. "Say you were to put all (private students) into the public system, it would be much more than just a $75 million burden." 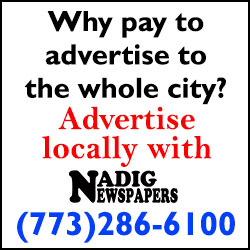 The bill also allows residents in wealthy school districts that fund more than 110 percent of their adequacy target to petition for referenda to lower their property taxes. The measure is scaled back from Rauner’s original efforts to freeze property tax rates statewide. Other measures included the scaling back of requirements for school physical education and driver’s education programs, which Rauner dubbed a part of "unfunded mandate relief for our schools, so that teachers can teach without restrictions." "I just shared our school’s theme for the year: ‘Get it right,’" Ebinger principal Serena Peterson-Kloso said. "Our state is finally on the way to ‘Getting it right."